Today marks a very special day for CART. In November 2010 CART CIO for Coleshill, Bill Ashby, a retired Halcrow Engineer teamed up with fellow CART member Ian Edwards. Bill and Ian were soon formulating a plan to digitise the little information that was then available of Coleshill House and the outbuildings. 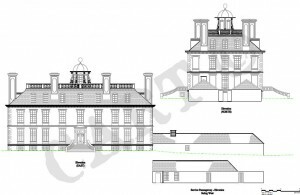 Using historical photos and a few basic drawings they have produced a set of drawings of the house, Stable Block and Clockhouse. 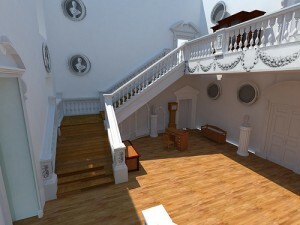 The intention is to create a full 3D video walk through of the exterior and interior. Ian has also created some visualisations of the site and inside of the house using AutoCAD, Sketch-up and 3D StudioMax software.